"Guys And Dolls" Screening / Panel Spotlights The Hollywood Musical And Designer Oliver Smith To Kick Off The 2016 ADG Film Society Screening Series "Production Design: Looking At Nothing, Seeing Everything"
(l to r) Marlon Brando, Jean Simmons, Frank Sinatra and Vivian Blaine in "Guys & Dolls." 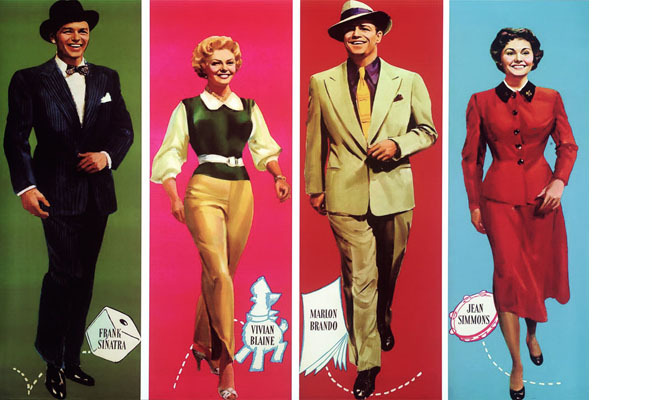 (l to r) Frank Sinatra, Vivian Blaine, Marlon Brando, and Jean Simmons in "Guys & Dolls" promo poster. Marlon Brando with showgirls in "Guys & Dolls." Marlon Brando and Jean Simmons in "Guys & Dolls." "Guys & Dolls" in french promo poster. 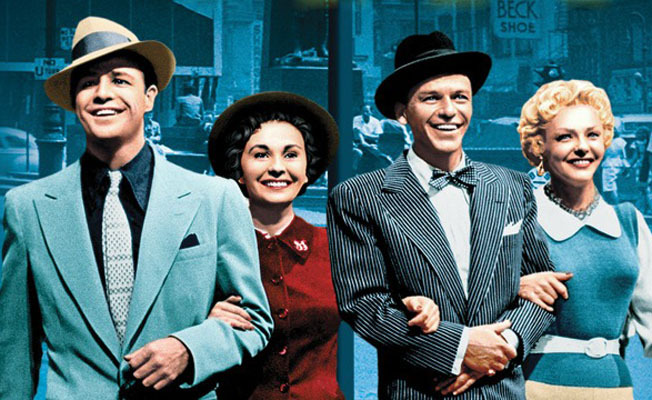 Frank Sinatra, Vivian Blaine, Marlon Brando, and Jean Simmons on "Guys & Dolls" promo poster. The Art Directors Guild (ADG) Film Society and American Cinematheque kick off the 2016 ADG Film Society Series with a special program OLIVER SMITH: THE HOLLYWOOD MUSICAL BY DESIGN /GUYS AND DOLLS (1955) showcasing Oscar®-nominated Production Designer Oliver Smith, on Sunday, April 17, at 5:30 PM at the Aero Theatre (1328 Montana Avenue, Santa Monica). The program, which includes selections from Oliver’s films The Band Wagon (1953), Oklahoma (1955) and Porgy and Bess (1959) will be moderated by ADG Film Society co-chair and Emmy®-winning Production Designer John Iacovelli (Peter Pan), himself a student of Smith. This will be the season's first program of the 2016 ADG Film Series entitled “PRODUCTION DESIGN: LOOKING AT NOTHING, SEEING EVERYTHING,” sponsored by The Hollywood Reporter. Oliver Smith was one of the most prolific and imaginative designers in the history of American theater. His designs include screen adaptations of The Sound of Music (1965) and The Unsinkable Molly Brown (1964) in addition to such Broadway hits as Brigadoon, West Side Story, My Fair Lady, Camelot and Hello, Dolly! He was nominated for 25 Tony Awards and won 10. 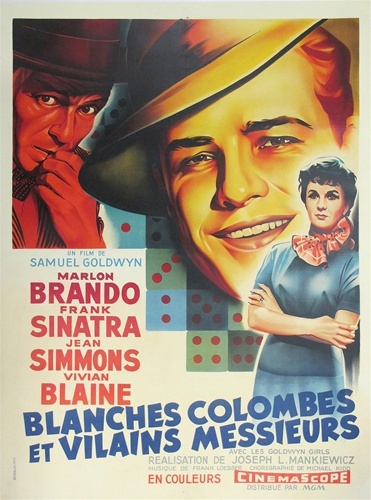 Smith was also nominated for an Academy Award in Art Direction-Set Decoration for Guys and Dolls, starring Marlon Brando, Jean Simmons and Frank Sinatra. The musical takes place in New York when a gambler is challenged to take a cold female missionary to Havana, but they fall for each other, and the bet has a hidden motive to finance a crap game. “The Art Directors Guild Film Society is honored to host an exceptional panel of artists, all who were students of Production Designer Oliver Smith, to discuss his legacy and his unique talents that perfected American musicals,” said Iacovelli. Joining him for the post-show discussion will be Production Designers JEFFREY BEECROFT (Dances with Wolves, Transformers: Age of Extinction), HOWARD CUMMINGS (The Knick, The Usual Suspects, Behind the Candelabra), MAYNE BERKE (The Princess Diaries, S.W.A.T.) and KALINA IVANOV (Little Miss Sunshine, Grey Gardens, Smash, Poltergeist). Sunday, July 31 - HAROLD AND LILLIAN: A HOLLYWOOD LOVE STORY - The Hollywood Premiere at the Egyptian Theatre Spotlighting Harold and Lillian Michelson with Director Daniel Raim and Lillian Michelson. Representing the ADG are Film Society Co-Chairs Thomas A. Walsh, John Muto and John Iacovelli and Debbie Patton, ADG Manager, Awards and Events. Working with them are the American Cinematheque’s Gwen Deglise, Margot Gerber, and Grant Moninger. General admission: $11. American Cinematheque members: $7. Students/Seniors with valid ID: $9. All screenings start at 5:30 PM; 24-hour information is available at 323-466-FILM (3456). For Information about the 2016 ADG Film Series click here. The Art Directors Guild (IATSE Local 800) represents 2,300 members who work throughout the United States, Canada and the rest of the world in film, television and theater as Production Designers, Art Directors, Assistant Art Directors; Scenic, Title and Graphic Artists; Illustrators and Matte Artists; Set Designers and Model Makers; and Previs Artists. Established in 1937, the ADG's ongoing activities include a Film Society, an annual Awards Banquet, a creative/technology community (5D: The Future of Immersive Design), a bimonthly craft magazine (Perspective); and extensive technology-training programs, figure drawing and other creative workshops and year-round Gallery 800 art exhibitions. The Guild's Online Directory/Website Resource is at www.adg.org. Connect with the Art Directors Guild on Facebook, Twitter and Instagram. Established in 1981, the American Cinematheque is a 501 C 3 non-profit viewer-supported film exhibition and cultural organization dedicated to the celebration of the Moving Picture in all of its forms. At the Egyptian Theatre, the Cinematheque presents daily film and video programming which ranges from the classics of American and international cinema to new independent films and digital work. Exhibition of rare works, special and rare prints, etc., combined with fascinating post-screening discussions with the filmmakers who created the work, are a Cinematheque tradition that keep audiences coming back for once-in-a-lifetime cinema experiences. The American Cinematheque renovated and reopened (on Dec. 4, 1998) the historic 1922 Hollywood Egyptian Theatre. This includes a state-of-the-art 616-seat theatre housed within Sid Grauman's first grand movie palace on Hollywood Boulevard. The exotic courtyard is fully restored to its 1922 grandeur. The Egyptian was the home of the very first Hollywood movie premiere in 1922. In January 2005 the American Cinematheque expanded its programming to the 1940 Aero Theatre on Montana Avenue in Santa Monica. For more information about American Cinematheque, visit the website at http://www.americancinematheque.com Follow the American Cinematheque on Twitter: @sidgrauman and on Facebook: Egyptian Theatre, Aero Theatre.